WhatIfSports.com simulated the Army vs. Navy game 101 times to predict which team will win this Saturday. Thanks to Clemson’s win, our simulations for the Game of the Week improved to an astounding 12-2 this season. We were also correct 78.8 percent of the time with games involving AP Top 25 teams during the 2016 season. Both Donnel Pumphrey and Rashaad Penny of San Diego State rushed for over 110 yards and at least one score against the Cowboys of Wyoming. The Aztecs secured the Mountain West conference title by a three-point victory. We predicted San Diego State to win 59.4 percent of the time, by an average score of 30.3-27.5. Navy was being considered as the non-Power 5 team to reach a New Year’s Day bowl. However, they needed to win the AAC first. Temple put an end to that conversation. Phillip Walker connected with Keith Kirkwood on a couple of big passes and the Owls earned the win. We predicted Navy to win 57.4 percent of the time, by an average score of 30.6-28.7. Track our 2016 performance or view our accuracy last season, when we correctly picked the winner in 80.0 percent of all games involving FBS teams. Speaking of Navy, the Midshipmen and Black Knights are our lone simulation for Week 15. Their momentum might not be as great as it was before last week’s loss, but the Midshipmen will still be ready for their rivals. Navy has won 14 straight matchups against Army, dating back to 2002. Will Worth was the Midshipmen’s greatest weapon, but the dual-threat QB was injured in the loss to Temple and will miss the remainder of the season. Navy’s second-best runner, Toneo Gulley, was also injured in the loss. He too will miss this game. That leaves sophomore Zach Abey to lead the offense. He threw two interceptions against the Owls. 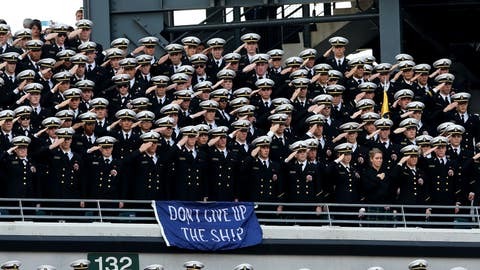 Our computer still likes Navy to continue its winning streak against Army. Navy wins 67.1 percent of the time, by an average score of 30.0-24.8. In addition, view our Week 15 power rankings or visit our college football archive for predictions from past weeks. For more statistics, view our weekly college football predictions.